The story of life at our new premium nursing home in Berkshire. 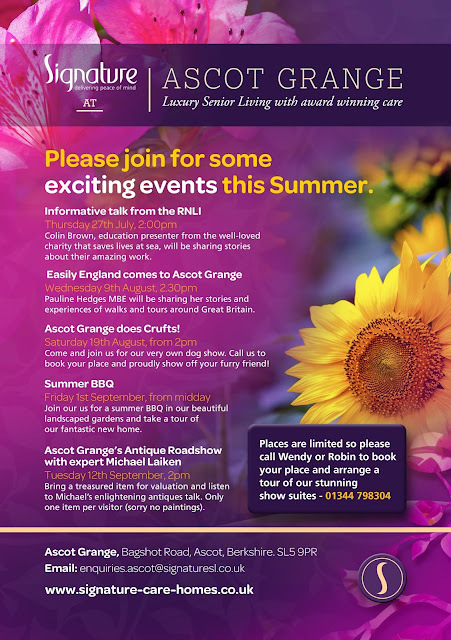 We have some exciting events coming up at Ascot Grange. Call today and reserve your place! Its been such a busy time for us and we are thrilled to have welcomed our first residents last week as they made our new home theirs! We officially opened our doors to residents Monday 26th June having been given approval by the CQC. Ascot Grange offers extensive facilities within a luxurious, comfortable and homely environment. Assisted living enables residents to live independently with care and support available 24 hours a day. Our accommodation ranges from private studios all with ensuite facilities and stunning one bedroom apartments than enable couples to stay together. Many of our suites have garden views and patio doors enabling you to enjoy our beautiful surroundings in your own private space. As Monday arrived the team welcomed our first four ladies through the door with flowers and gifts and their families enjoyed a three course meal in our fine dining restaurant, The Orangery. Our home offers a choice of dining facilities as well as our Little Violet Café where residents and visitors can enjoy coffee and a selection of delicious home made cakes prepared daily by our chef Russell. We have a fabulous week of activities planned and are making good use of our in house spa and cinema as well as the beautiful landscaped gardens for some out door fun. As a pet friendly home, we are delighted to allow our residents the opportunity to still have their beloved pets living with them. At Ascot Grange our award winning care is delivered by our very own in-house carers and nursing team, ensuring our residents can be supported up until the end of their lives. Our services also feature a dedicated specialist dementia suite. Signature Senior Lifestyle is delighted to be recognised as one the top 20 care home groups in the UK and we also had 19 finalists in the Great British Care awards in 2016. We are now taking respite bookings at Ascot Grange and if you would like a short term break or support following an operation please call for availability. Have a lovely week and do call in and see us when passing. What a fabulous weekend we have had here at Ascot Grange. This was our first opportunity to show visitors our stunning new home and we welcomed nearly 100 people in throughout the weekend. Saturday commenced bright and early, the sun was shining and Councillor John Lenton and his wife Margaret, the newly appointed Mayor of the Royal Borough of Windsor and Maidenhead, gave a welcome speech. He then toured the home which he said was a welcome addition to the community and he can't wait to come back and meet our residents. Throughout the weekend we served champagne and canapés prepared by our Head chef Russell and visitors enjoyed relaxing in our beautiful landscaped gardens while listening to the jazz band. Guests had the opportunity to tour our 96 bedded home that offers independent and assisted living with a separate specialist dementia suite. With a delightful café, two restaurants, cinema and spacious activities room, visitors were hugely impressed with the space and size of the accommodation on offer. 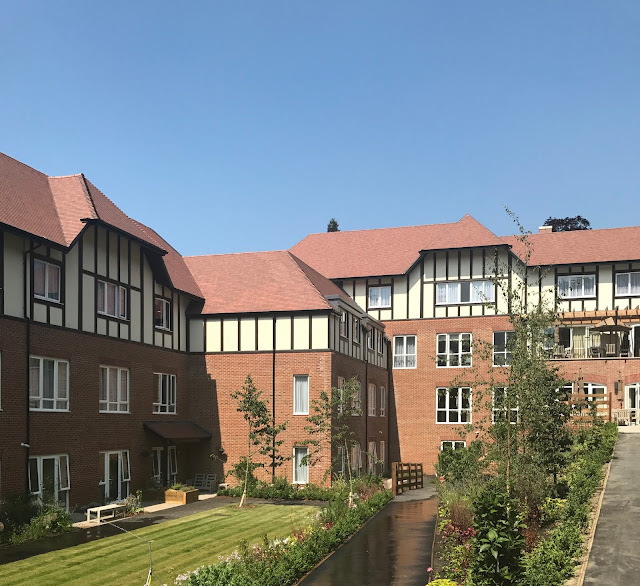 Signatures award winning care will be on offer 24 hours a day enabling residents to have the care and support they need within a luxurious but home from home environment. Call us on 01344 636050 to book your visit and see what we have to offer. 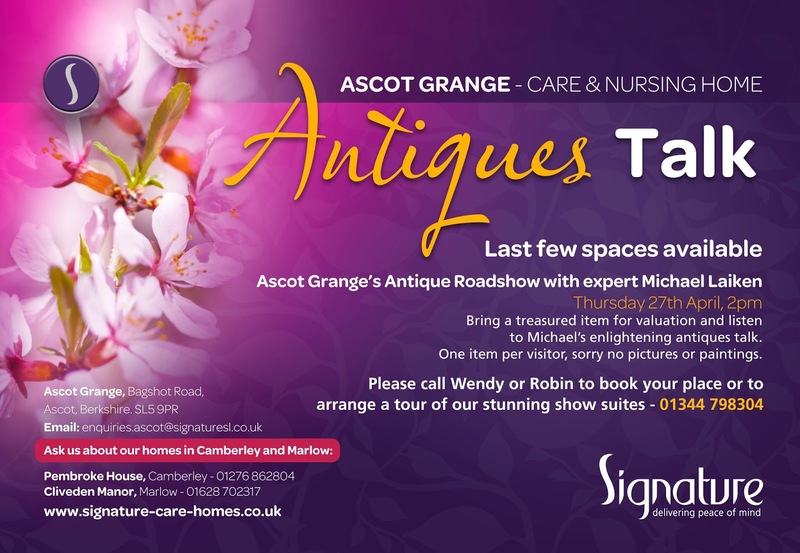 We look forward to seeing you at Ascot Grange soon! Your first opportunity to tour our beautiful new home is fast approaching. Saturday 10th June at 10am we have the official opening with the Mayor and will welcome visitors in. Enjoy champagne and canapés while listening to the string quartet, meet the team and view our facilities and apartments. Do call and confirm if you will be attending on 01344 797805 and don't worry if you cant make it we are offering a second chance to view on Sunday the 11th June at 11am. 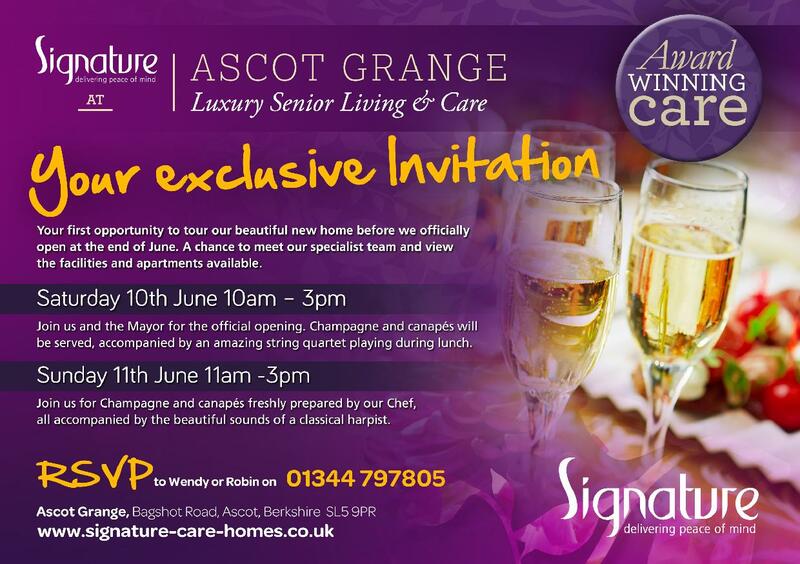 Ascot Grange will officially be accepting residents from the 26th June and is delighted that Signature's award winning care is available here in Berkshire. The team at Ascot Grange had a great visit today to Hurst Lodge School. Year 6 children were invited to draw pictures illustrating what they loved about their Grandparents. It was extremely hard to choose a winner and we were delighted to announce that Savannah and Maria both won a place in the homes art gallery. Ascot Grange presented the winners with a £25 Amazon Voucher each and made a £100 donation to the school for art supplies. We look forward to working more with the school on another projects and inviting them to visit soon. We were delighted to welcome the Mayor for the Royal Borough of Windsor and Maidenhead to Ascot Grange today. Councillor Sayonara Luxton was hugely impressed with the facilities and was very excited to meet the team and understand how we will be supporting the local Community. We will be welcoming her back in July when our first residents have moved in to their new home. If you would like to arrange a visit please call Robin or Wendy on 01344 622624 who will be happy to help!